Rajen Babu – Is it necessary for me to take diksa again if I have already taken diksa from a kula-guru (hereditary family guru)? He does not eat fish or meat; he studies the Bhagavatam, is the son of a Gosvami and is a householder. These two types of non-devotees can never become spiritual masters. They are not devotees of Krsna. From this we understand that Sri Gurudeva must be a krsna-tattva-vetta (one who knows the science of Krsna). It is incorrect to assume that only those who are born in a high caste family, who has attained knowledge of the Absolute (brahma-jnana), or who are famous are entitled to be guru. Sri Gurudeva may externally be a brahmana, a sannyasi or a grhastha – that is irrelevant. If the spiritual master is not a krsna-tattva-vetta, he should be abandoned. Sri Guru is sadacari – one who correctly practices devotional principles. The question may be asked, “What is acara?” In reply it has been said, asat sanga tyaga – ei vaishnava achara. Who is asat? Those who are addicted to illicit connections with women (stri-sangi) and those who are averse to Krsna (krsnabhakta) –these are the two types of non-devotees. Their association must be abandoned. The general understanding of the term asat is that which is unreal. Sat is that which is unchangable, which is not transformable, which is not transmutable. The opposite state of sat is asat. There are two terms known a grhastha and grha-vrata. One who pays less attention to Krsna and is more attached to his wife, considering her to be the most cherished thing in his life, is known as yosit-sangi (one who is addicted to women). Such householders that are attached to matter, which is inferior to Krsna, are known as grha-vratas. Therefore a grha-vrata can never be a guru. Those who perform hari-bhajana – whether they are grhasthas or sannyasis –should be considered as most excellent. Otherwise even a sannyasi that does not perform hari-bhajana should be understood to be a non-devotee. Who is a devotee of Krsna? One who sees Brahman and Paramatma as separate from Krsna, who is the advaya-jnana-tattva (the non-dual Absolute), cannot become a devotee of Krsna due to their ignorance of vastu-tattva (the science of Absolute Reality). Brahman is that conscience relating to a subject that is known to be devoid of material distinctions. 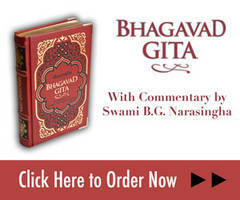 The Vedanta-sutras’ aphorism athato brahma jijnasa explains about inquiring into Brahman. When one is deprived of the eternally blissful darsana of saccidananda Bhagavan, and solely takes shelter of samvit-vritti (the cognitive faculty), which although is a substance imbued with the divine lila of the Supreme, one experiences Brahman. And when one is deprived of the blissful darsana of saccidananda Bhagavan, and only pursues sat-cit vritti (the faculty of eternity and cognition), which although is a substance imbued with the divine lila of the Supreme, one attains darsana only of Paramatma. Bhagavan is akhanda-tattva-rupa (the form of all tattvas), as He possesses all potencies due to His complete manifestations. Yet Brahman, who does not manifest similar attributes, is but a part of Bhagavan, or an incomplete manifestation. Independence due to maya, or ignorance, results in voluntary subjection to duality. As a result of such secondary interests, a sense of discrimination arises in relation to the non-dual Absolute form of Vrajendra-nandana Krsna and His name, form, qualities and pastimes. Because of the fetters of material intelligence in relation to the form of Vishnu, and due to a continual lack of understanding of Bhagavan’s advaya-jnana, independent ideas such as jnana-yoga etc. are imagined to be different ways to attain Brahman and Paramatma. The jiva then retires from accepting topics concerning devotion to Bhagavan and having invoked various philosophical ideas, he is shackled to the jungle of this material world. When one is completely free from the desire for jnana, karma etc. and only performs activities that please Krsna, that is the sign of uttama-bhakti (pure devotion). Those who wish to differ even a fraction from this point or desire to pollute it with some ‘alloy’ should be included amongst those who are abhaktas (non-devotees). They are unfit to be gurus. The difference between a grhastha and a grha-vrata has been explained in these verses from Bhagavatam. A grha-vrata is one who cannot understand Krsna. Realization of Krsna cannot be achieved simply through the instructions of others, through one’s own endeavors or by mutual discussions. This is because the activities of the senses never follow the complete, pure and eternally liberated direction of the Absolute. Attempts to follow the non-Absolute are the endeavors of the grha-vrati. The grha-vrati tries to enter that which is finite with a great deal of trouble. Anything within our sensuous jurisdiction cannot be Bhagavan. The good fortune to attain darsana of Krsna only arises when His maya potency is lifted. It is the dharma of the grha-vrati to always participate in discussions that neglect Krsna. Although externally they may seem the same, the difference between the grhastha who is a devotee of Bhagavan and the grha-vrati who is averse to Bhagavan is like the difference between heaven and hell. The exterior and interior of a house are not one. The grhastha devote considers every object in his home as objects that are meant for serving Krsna and offers them to the transcendental senses of Krsna. But the non-devotee grha-medhi remains busy serving his own senses and ignores service to Krsna. The baddha-jiva has two tendencies – the avarana of maya (which covers the soul’s natural spiritual knowledge) and viksepatmika (that which overwhelms the soul with ideas that have nothing to do with the Absolute Truth). Such foreign things are considered as an impediment and obstruct the jiva’s natural instinct to serve. It bewilders the jiva’s understanding of that which is to be understood and mutilates it. The example of opaque glass and transparent glass may be discussed. An object cannot be seen through opaque glass. Some obstacles appear between my eyes and the object that is to be seen. I can see something through a transparent object. Similarly we cannot take darsana of the Absolute Truth (para-tattva) through the medium of an opaque guru, or guru-bruva. Rather than offering everything that is given to him by his disciples to the lotus feet of Bhagavan, the guru-bruva consumes everything himself. Thus, having surrendered to such an opaque guru, the disciple is deprived of attaining real spirituality. 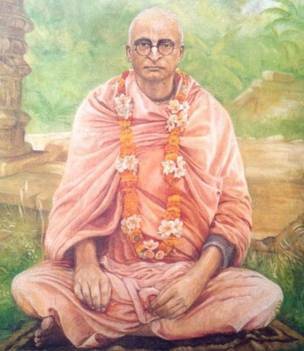 Rajen Babu: Can’t a kanistha Vaisnava become a guru? Prabhupada: Kanistha, madhyama and uttama are the gradations amongst Vaisnavas. In the kanistha stage of Vaisnavism, only non-Vaisnavism is absent – this I shall explain in detail a little later. How can we deliberate upon adhikara and define who is a Vaisnava without taking shelter of a sad-guru? Only Gurudeva can explain adhikara. How can one who has never entered the domain of a devotee, who cannot himself understand anything, explain such things to others? If a non-Vaisnava sits on the seat of the guru, it amounts to sheer contempt of guru-tattva. Knowledge of a particular subject can only be obtained from one who has experience in that subject. If someone were given the position of a judge, how would he judge if he has not even elementary knowledge of justice? One who has no knowledge of mathematics cannot teach that subject. If one wants to know how to swim, he must go to a swimmer; if one wishes to learn how to be a smithy, one must go to a smith. There is a shop near a house where things are purchased regularly. However, at present the shop is in a deplorable state and its products have become substandard. Yet the shop next to it sells wholesome fresh goods. Then what will the customer do? Will he continue to purchase inferior goods simply to honor tradition or will he choose the fresh items? If an inexperienced family doctor is incapable of treating a patient properly, is it not proper to consult a more knowledgeable doctor? In such a situation, if a good doctor is found in Switzerland, then he is brought in. Just as when one expects to find wealth from a pauper or wisdom from a fool, similarly there is the rule, andhenaiva niyamana yatha’ndha – when a blind man leads another blind man, both will attain a dark destination and nothing more. Therefore one must approach a transparent guru. Such things demand cognitional activities and if an opaque guru comes in-between and creates an obstacle in achieving them, it becomes a matter of great misery. Thus, one must remember the Vaisnava principle of asat-sanga tyaga. One will never attain the mercy of Krsna if he tries to gratify and serve his wife, friend, servant etc. instead of Krsna. Just as we serve our faithful sons in order to receive service from them later, similarly if I serve Krsna with the same mentality in the hope of gaining something, then I don't offer myself as a servitor. Rather, we make that divine object our servant. A true Vaisnava does not make disciples. Where is the scope for him to lord over the world when he sees everything fully in the spirit of served and server (sevya-sevaka)? How is it possible for him to accept service offered by someone else? One who does not serve Bhagavan, but accepts another’s service on the pretext of serving others, is an atheist. Gurudeva is the messenger of the Para-tattva and a servant of the Absolute. One who steals the property of the Absolute is laghu (low), not guru (great). Taking from a disciple is indicative of laghutva. Accepting objects from a disciple is nothing more than accepting his stool and urine. It is the duty of the transparent guru to take all the service offered by the disciple to the lotus feet of Krsna. The opaque guru makes disciples out of his greed for wealth and instead of offering the items dedicated to serve Krsna, he enjoys them himself, and thus he continuously deceives the disciple.